During the winter, when I’m looking for “something to do” I sometimes stop in to one of the local gear head hangs on Sunday morning at Captree State Park. The best thing about these types of loose gatherings is that you never know what is going to turn up. There is always plenty of eye candy on hand. Today, amongst the rows of parked hotrods, vintage beauties, Ferraris and Lamborghinis was my favorite thing of the day… a sweet bobber. Now, this may not be something anyone would immediately identify as my type of motorcycle for riding, and that may be true – but I think it drips coolness. Admittedly I don’t know anything about the bike or the powerplant. Please school me if you know anything by looking at the pic. Did any of you eagle-eyed readers happen to notice on the Rat Fink sticker on the right side? I am strangely infatuated with Ed “Big Daddy” Roth‘s work. Believe it or not, when the rider pulled in the first thing my eyes went to was Rat Fink. 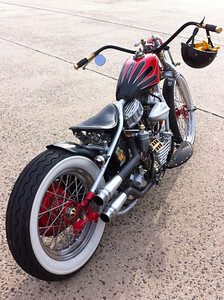 Very cool bike! I did notice the RF sticker. I think you have to be a pretty cool person riding this bike. Looks to be a Pan-Head? 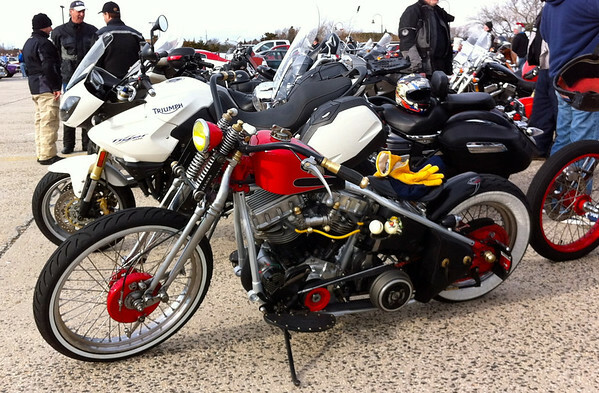 I too like Bobbers, but don’t know diddly about bike power/motors and the like. 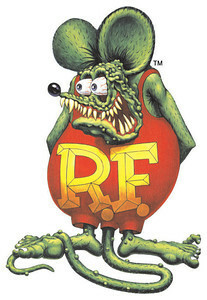 I didn’t catch Rat fink until you mentioned him, but my co-worker loves the Rat fink character and the Ed Roth’s work.